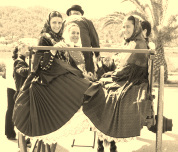 At present the group is formed by sixty dancers, singers and “sonadors” (musicians), ages from four years onwards. Over the years this group has participated in various folkore festivals of both national and international levels. National: Boecillo, la flecha, Valdepeñas, Cuellar, Cuenca, Menorca, Valencia, Murcia, Los Realejos, Cantabria, Sondika etc. International: Germany, Cyprus, Portugal, France and Switzerland. The association participates actively in the local patron saints day of Sant Jordi de Ses Salines and Sant Francesc de S'Estany and also other local feast days of Ibiza as well as public functions and Institutional acts when required. Every year coinciding with the local patron saints day of Sant Jordi a folklore fair takes place where other groups are invited and more than a hundred artisans exhibit there traditional work. Since the year 2007, the group has been organizing the popular “Xacota Pagesa” celebrated at Christmas time and counting on the best singers, dancers and sonadors from the Pitiüsas. 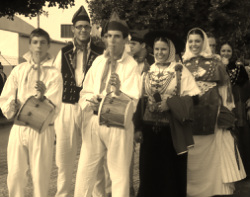 With the intention of bringing its members closer to the community, the group organize popular fiestas and other events not necessarily linked to the Ibicencan.